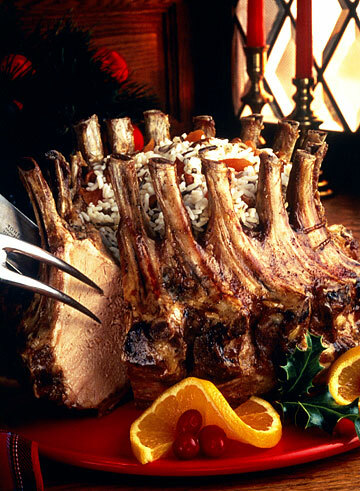 A Pork Crown Roast filled with with rice stuffing makes a dramatic centerpiece for Christmas dinner. Preparing one is surprisingly simple, but does require pre-ordering the meat from your supermarket butcher. OF ALL the main courses I've served at Christmas over the years, the Crown Roast of Pork has been the most admired, the most requested by guests and the most trouble-free. This regal, showy centerpiece is one of the most spectacular and sumptuous of traditional Christmas entrées. It is also deceptively easy. The basic recipe can be as elementary as this: Preheat oven. Sprinkle roast with salt and pepper. Place on foil-lined pan. Bake. The roast will scent your entire house, and because you are carving the sweetest and moistest cut of pork, its taste will be as delicious as its appearance. I've embellished the "sprinkle with salt and pepper and roast" recipe using different basting, stuffing and decorating ideas, but even then, the roast takes little time to prepare. The reason is that my butcher has done the majority of the work, and yours can, too, if you order the roast in advance, know just what to ask for, and utilize your butcher's expertise. First, you will need to order at least two days ahead of your dinner. I've always allowed a week or more during this busy season, but all of the butchers I spoke with this year said that two to three days notice should be enough. This will guarantee that they have the pork in stock, and will give them time to cut and tie it into the distinctive circular shape, the ribs bending outward to look like the top of a crown. I've picked up excellent roasts from Safeway, and managers at Times, Foodland and Star markets all assured me that not only could they prepare the roast, the cost would be at the price of the pork that day, with no extra charge for their special work. You can expect the price to average $5.29 a pound unless you happen on a day when pork loin rib portions are on sale (the lowest price I've found was $2.99 a pound -- you should be so lucky!). A crown roast of pork (do specify pork; crown roasts are also made from lamb). A 16-rib roast is a good size. I've served 20 guests generously with this size roast, with several appetizers and side dishes. A realistic gauge is to allow one rib per serving, You may also order by weight (expect to pay for 8 to 10 pounds), but because these large cuts must be joined at the ends, bent into shape, and tied together, the rib count is a more realistic guide. If you want your roast to look like the one in the photograph, ask that the rib bones be left long. Your butcher will also "french" them, which means scraping the meat from the ends. The chine bone is usually removed, and small cuts may be made between bones so you'll have no trouble carving the roast. Some stuffing recipes call for using the pork trimmings, in which case you'll need to ask for these (they'll be placed in a bag in the center of the roast). Artistry is involved in preparing this roast, and the butchers I spoke with were veterans who took pride in their work. One laughed that some "young kids" might never have seen this cut, but he liked showing them how to make it. Stuffing: Although you don't need to stuff the crown roast, its shape makes it a perfect container for a favorite stuffing, whether its basis is wild rice, cornbread, couscous, rice (see the Rice-Stuffed Pork Crown Roast recipe that follows) or your tried-and-true bread stuffing. Dried cranberries may be added to any of these to give them extra zing and a Christmasy appearance. I'm a die-hard "in bird"
stuffing lover for turkeys, but prefer to make the crown roast's stuffing separately. An "in roast"
stuffing adds to the cooking time, and although I don't agree that it dries out the meat, it seems easier to make it up ahead, make sure it's cooked to a safe temperature, then reheat it on the oven shelf beneath the roast or beside it. I mound some of the stuffing inside the crown toward the end of the baking time and brown the top for a beautiful presentation (and one less serving bowl). The Ontario Pork trade group's Web site (www.porkpeople.com) recommends making a "chimney" of an empty can that fits snugly inside the crown to keep its shape intact, but a crumpled ball of foil does the job just as well. Both techniques allow air to circulate inside the crown. Seasoning: Salt and freshly ground black pepper will do it, but to add your own touch to the dish, try your favorite fresh or dried herbs or a dry rub that goes well with pork. Basting: Again, this isn't essential, but you can gild the lily with citrus or wine-based glazes. Because you lose heat each time the oven door is opened, it's best not to baste too often. Roasting: If you don't have an instant-read meat thermometer, buy yourself this indispensable Christmas gift before preparing the pork so you won't fret about under- or overcooking. Except for that, the only equipment needed is foil (for placing inside the roast, covering the bone tips so they don't burn, and lining the pan) and a shallow, heavy-duty roasting pan. If the roast seems to be getting too brown, tent it with foil for a while. Your roast will be admired if you simply present it on a large, pretty platter, but you can decorate it when you plan your Christmas table. If you've roasted it with fruits or vegetables, spoon them around the crown and tuck in some bay leaves or fresh green herbs for a seasonal effect. I have a rosemary bush that provides branches that look very festive when tucked over and under the twine that holds the roast together -- this I do while the meat rests. Small, inexpensive sprigs of plastic holly or garland material also can be placed around the crown. Measure them beforehand. Kitchen stores and some grocery stores carry the frilled coverings that top the ends of the rib bones (they look like little chefs' hats), but you can also make your own. Cut 2-inch strips of heavy foil, double them lengthwise, then wind a piece around your finger a couple of times. Cut enough of these to wrap around the rib tops, one for each bone. Then cut slits half an inch or so along the tops, and press these into frills. One year when my Christmas tree, house and table decorations were gold, I made frills from shiny metallic gold gift wrap and they worked perfectly. I've seen ribs topped with small fruit and vegetable "jewels," as well. Cherry tomatoes or spiced crab apples from jars are perfect. You can also purchase spiced apple rings in jars and loop the rings over the ribs in overlapping patterns for the ultimate in edible crown jewels. Although this moist, sweet, roast needs nothing to cover its natural flavor, several recipes include sauces or gravies. You might consider serving colorful homemade cranberry sauce (or applesauce, which always complements pork), but I'd advise against gravy. Making gravy from the roast's drippings is not what you'll want to be doing at the last minute before serving. Once your crown roast is decorated, bejeweled and carried to the table where all have admired it, you can carve it at the table or (and I think this is a better choice), return it briefly to the kitchen where the butcher's twine and decorations can be removed and the carving done more easily. My husband carves the meat between the ribs into large pork chops, then cuts each chop at an angle into two servings. We then fan out the pieces on the platter around an uncut portion of the roast, the ones with ribs overlapping, and tuck the garnishes back in wherever they look attractive. The platter is returned to the table and guests take their choice of bone-in or boneless pieces. The men usually choose to nibble on the bones, so provide plenty of Christmas napkins! Put a large ball of crumpled foil in center of roast to keep its shape. Sprinkle with Hawaiian seasoning. Cut slits between bones and insert plugs of thyme and garlic. Cover rib tops with heavy foil. Place roast, ribs up, in large foil-lined roasting pan on a rack in lower third of oven. Sprinkle onions and pears with a little Hawaiian seasoning and place onions around roast. Roast 1 hour, 15 minutes, basting with glaze every 20 minutes. Add pears. Roast another hour until a meat thermometer in the thickest part of the meat (not touching the bones), reads 155 degrees; continue basting until glaze is used up. Remove roast from oven and let rest 20 minutes before serving. Serves 16 to 20. Note: I use a seasoned salt mix called Firehouse Flavors, made by Derbz Herbz in Waianae, but any mixture of sea salt and seasonings would work. Approximate nutritional analysis, per serving (not including Hawaiian seasonings, which will add sodium): 750 calories, 54 g total fat, 20 g saturated fat, 215 mg cholesterol, 170 mg sodium, 11 g carbohydrate, 2 g fiber, 6 g sugar, 52 g protein. Place roast, bone tips up, on rack in a shallow roasting pan. Cover ends of bones with strips of foil. Bake 1-1/2 to 2 hours. Combine orange juice concentrate and honey, mixing well. Set aside. While roast is baking, cook rice according to package directions, adding apricots in the last 10 minutes and cinnamon during the last 5 minutes of cooking time. Combine rice mixture and chopped pecans; mix well. Fill roast cavity with rice mixture. Place remaining stuffing in a small baking dish. Dot with butter. Brush roast with orange juice mixture. Return roast to oven with baking dish of stuffing. Bake 30 more minutes, or until internal temperature registers 155 degrees. (Allow about 20 minutes per pound total cooking time). Brush occasionally with orange juice mixture. Let roast stand 10 to 15 minutes to allow juices to set. Carefully transfer roast to a warm serving platter. Garnish with orange slices and cranberries, if desired. Serves 16. Approximate nutritional analysis: 596 calories, 23 g total fat, 8 g saturated fat, 93 mg sodium, 119 mg cholesterol, 46 g carbohydrate, 2 g fiber, 50 g protein. Nutritional analyses by Joannie Dobbs, Ph.D., C.N.S. and the Pork Information Bureau.